As part of IRONMAN 70.3 Oceanside weekend, come join us for a life-changing morning, not just for the challenged athletes you will be helping, but for you as well. 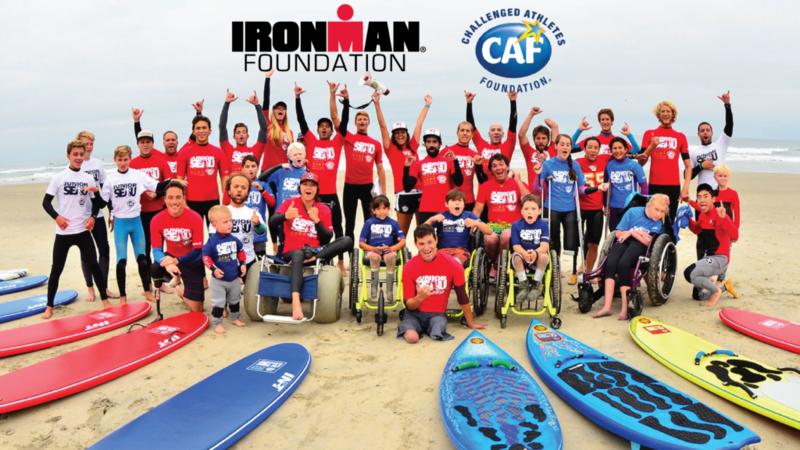 In an exclusive IRONMAN Foundation Service Project opportunity, we will be partnering with the Challenged Athletes Foundation to host a Junior Seau Foundation adaptive surf clinic for youth, women and military/adults with disabilities where they’ll learn to paddle and catch some waves. Prepare to be inspired as you work directly with the coaches and the participants, who will stand on their surf boards for the first time. A feat they never thought possible, and one that you will help make possible. Check out the video from the 2019 Junior Seau Foundation Adaptive Youth Surf Clinic presented by Challenged Athletes Foundation! This project is part of the IRONMAN Foundation in Service Initiative and volunteer spots are extremely limited. Volunteers receive nutrition, hydration, rash guard. Wetsuits are required. Online registration for the service project is now closed; However, we invite you to attend the clinic as a spectator!